The Nebraska eviction notice forms are used to being the eviction process in Nebraska (known as an ‘Action for Possession’ ). Before any filings can be made in the court, proper notice must be given. After notice is given and tenant does not respond, landlord may file a Complaint and Summons in County Court and have them served by the local sheriff’s office. If the tenant fails to respond, even after a Summons, the court may issue a Writ of Restitution directing the sheriff to remove the tenant. 3-Day Notice to Quit (Non-Payment of Rent) – When a lessee has failed to pay the rent on time as provided in the terms of the lease. 14/30 Day Notice to Quit (Non-Compliance) – For use when a tenant has failed to abide by the terms of the lease, other than the failure to pay rent. The tenant shall have fourteen (14) days to fix the stated violation. If it is not cured then the tenant will be forced to move-out of the property within thirty (30) days. Furthermore, if the violation is the same occurrence in the last six (6) months, the landlord has the option to cancel the lease with fourteen (14) days’ notice. 30-Day Notice to Quit (Month to Month) – For use by a party to let the other party know that the month to month tenancy will not be renewed at the end of a certain period. The minimum time-period as provided by Nebraska law is thirty (30) days. Rent is due on the date specified in the lease. Landlord must give tenant three days notice of non-payment before beginning eviction proceedings. Step 2 – If tenant fails to respond within the time period allowed, landlord may file a forcible entry and detainer complaint and Summons in County Court. Once it is filed, landlord should have the local sheriff make sure to have the complaint and summons served on the tenant. Step 3 – If landlord obtains a judgment in his or her favor, he may obtain a Writ of Restitution from the court to authorize the sheriff to move the tenant out of the premises. The Lessor Lessee Property Agreement should be obtained for review. You will need some of the information present on this document. You will be able to report this information along with the desired Notice on the Nebraska Notice To Quit form available through the PDF, ODT, and Word buttons beneath the document image. Enter the Full Name of the person(s) you are sending this Notice to below the form Title. To define the blank spaces following the words “The premises herein…,” you will need to consult the Lease. There is no room for error. In this order report the Rented Property’s City, State, Zip Code, Building/Street, and Apartment Number on the blank spaces in this sentence. Landlords that are issuing this Notice to Tenants who have been negligent in their responsibilities have three statements provided below the words “(Check Appropriate Box)” to select the type of Notice this will be. Choose one of these three statements then, proceed to Step 5. If the subject of this Notice is a Month To Month Tenancy, then skip the three statements in this area and proceed to Step 4. The “Nonpayment” Notice must be issued by the Landlord to the Tenant(s) or Subtenant(s) that have not paid for a Rental Period(s). Mark this first check box to give the Tenant Three Days to remit the past due payment or yield control of the Leased Property to the Landlord. Selecting this Statement will also require a definition to an Authorized Agent, Dollar Amount Owed, Dollar Amount that must be paid, and the Rental Period the Mandatory Payment applies to in the available spaces. The “Noncompliance (1st Offense)” Notice must be issued by the Landlord to the Tenant(s) or Subtenant(s) who will be given Fourteen Days to correct a 1st Time Violation or yield their control of the Leased Property to the Landlord. Describe this violation on the blank line. The “Noncompliance” Notice must be issued by the Landlord to the Tenant(s) or Subtenant(s) who have committed the same violation within six months of receiving a “Noncompliance (1st Offense)” Notice. The Tenant(s) or Subtenant(s) will be given Fourteen Days to yield control of the Rented Property to the Landlord. You must describe this violation on the blank line. There are two options for a Month To Month Tenancy Notice to be provided through this document. Each one will require the Last Day of the Month To Month Agreement to be reported accurately using the three blank spaces. When reporting this Date, you will enter the Day on the first blank line of your chosen statement, the Month on the second blank line, and the year on the last blank line. Make sure the Last Active Date being named for the Month to Month Agreement must be at least Thirty Days after its receipt. Choose one of the following options. The first “Month to Month Tenancy” notice must be issued to the Tenant from the Landlord. Choose this statement if you are a Landlord ending a Month to Month Tenancy Agreement with the Tenant being Addressed. The second “Month to Month Tenancy” Notice must be issued to the Landlord from the Tenant. Choose this statement if you are a Tenant ending a Month to Month Tenancy Agreement with the Landlord Being Addressed. 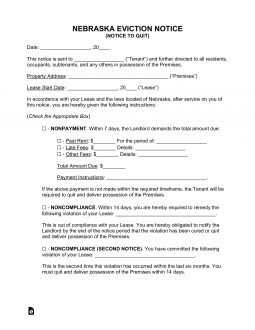 If you are the Property Owner, Landlord, or Authorized Agent of the Landlord issuing this Notice to a Tenant then, you must Sign the blank line under the Notification Statement. There will be a section strictly for the Deliverer of this Notice to fill out. The “Certificate of Service” section will provide a verification from the Deliverer this Notice was delivered. The Delivery Date (consisting of the Calendar Day, Month, and Year) will need to be entered on the first three blank lines. Then the Name of the individual this paperwork was delivered to must be entered on the fourth blank space. An additional aspect to this report will be a testimony to the manner the Notice was delivered. The first, second, and third check boxes will refer to a first party delivery, second party delivery, or delivery by the U.S. Postal Service using First class Mail. The Agent responsible for Delivery must sign his or her Name after making this selection.